This month’s club card was a rocket-fast card made with a wide slip of Designer Series Paper (DSP) from the Sweet Sorbet DSP (offered in the Sale-A-Bration catalog), a couple of die cuts and punches, a flower image from the Petal Parade stamp set (also found in the Sale-A-Bration catalog), and sentiment from Itty Bitty Banners. At first I was not in love with the Petal Parade Stamp Set offered by Stampin’ Up! as one of several free product with every $50 purchase. 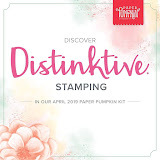 I think you will agree that this is going to make a swell addition to your collection of stamp sets like everything else by Stampin’ Up! The best part, of course, is the coordination of stamp sets to DSP or die cuts, and this stamp set coordinates with another free product in the Sale-A-Bration catalog, Sweet Sorbet DSP. Delicate colors that will complement your spring projects using the 2013-15 In Colors (Crisp Cantaloupe and Pistachio Pudding), 2012-14 In Colors (Summer Starfruit), and everyone’s staple, Pool Party from the Subtles Collection. Behind the stamped flower image you will recognize the Blossom Punch. The flower image is cut out using the Circles Collection Framelit (#4, I believe), and centered on a complete punch of Crisp Cantaloupe with the Blossom Punch. The second Blossom Punch of Summer Starfruit cut into 6 pieces and centered between each petal of the first flower. Finished with Pistachio Pudding leaves on stems using the Bird Builder Punch. If you need dimensions or detailed instructions, let me know, and I’d be happy to send them out to you. Send an email or message me below. It is unfortunate that Sale-A-Bration ends tomorrow, March 31, but all good things must come to an end, right! Still time to place an order. Please visit my online store – the quickest way to get there is to go to my Stampin’ Up! webpage and click the link to SHOP NOW. This way you can be sure that I am selected as your demonstrator. I certainly appreciate your order. And I appreciate your comments, too! Please leave me your comments. Let me know what you would be interested in seeing more of, less of, anything. 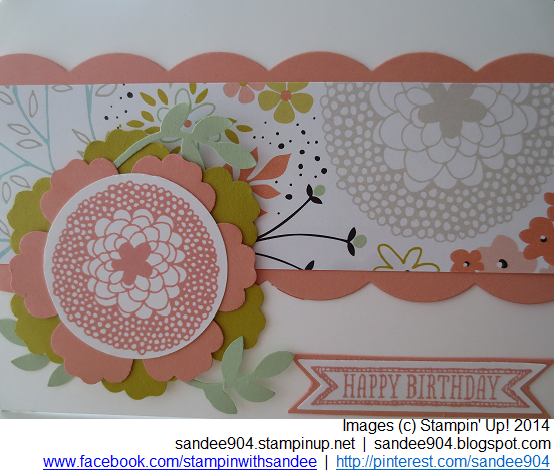 Also still time to join my Stampin’ Up! team for $99 during Sale-A-Bration (thru March 31, 2104). 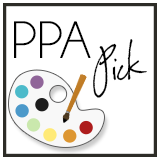 YOU will select $150 worth of product for your starter kit, and can start earning your product, learning some great craft ideas, and meeting some great people that turn into great friends!